2018 Membership Renewals: Memberships are due the first time you shop at the Co-op in 2018. The cost is still $24 for the entire year. Thank you for your continued support! 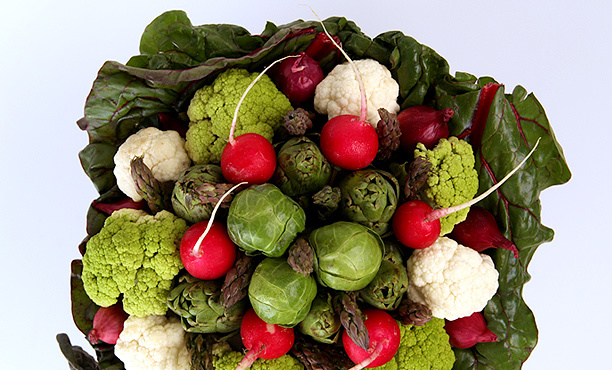 Local Produce Update: Due to the extremely low night time temperatures, local produce is scarce at the moment. We hope to be able to procure more soon. To view the online ordering deadline and delivery calendar, click HERE. 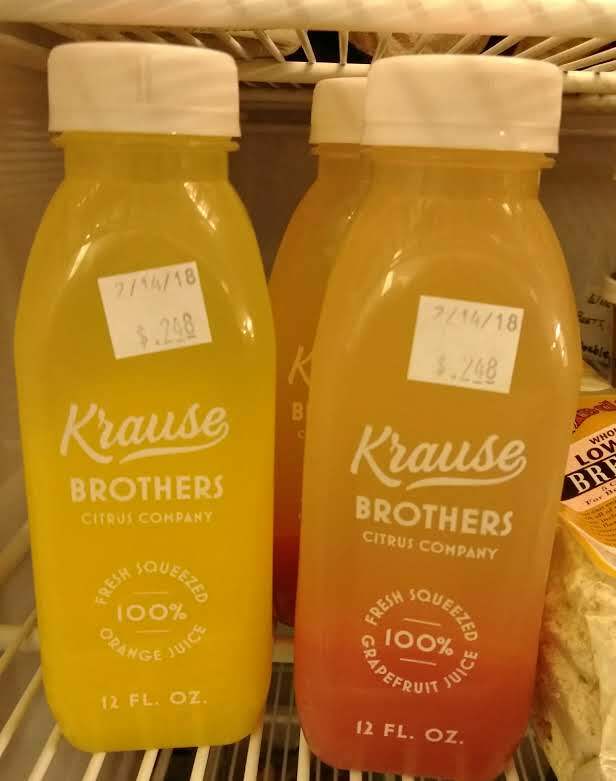 Krause Brothers Citrus & Juice: We will order when we meet minimum order requirements. UNFI: The next delivery will be available Thursday, March 8th. The next ordering deadline is Monday, March 12th, available Thursday, March 22th. 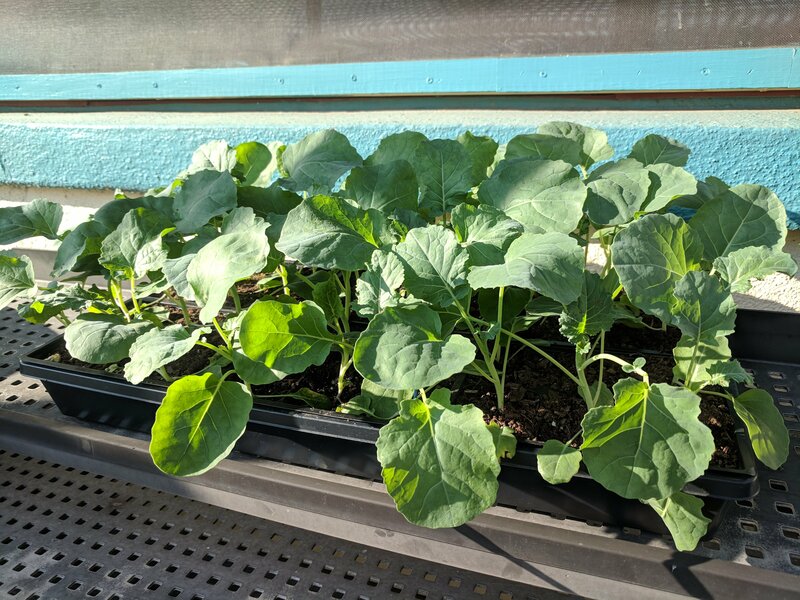 Frontier Herbs: February’s fourth Wednesday deadline is Wednesday, February 28th. Happy Cow: The next order deadline will be Saturday, March 3rd for delivery on Monday, March 5th. Split Creek: An order will be placed as needed. Dimpflmeier Bread: An order was received on Friday, August 11th. Still some product in freezer. 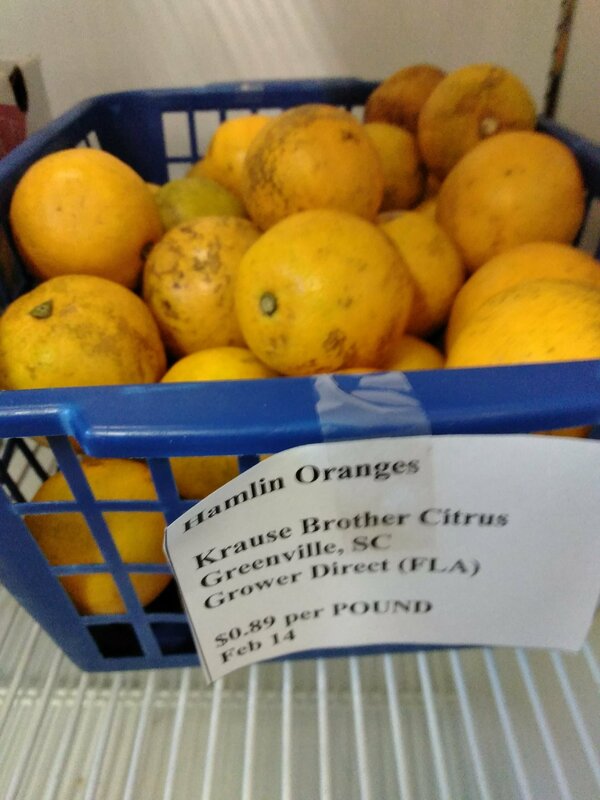 We have a new vendor, Krause Brothers, who provide fresh citrus direct from their family owned farm in Florida. 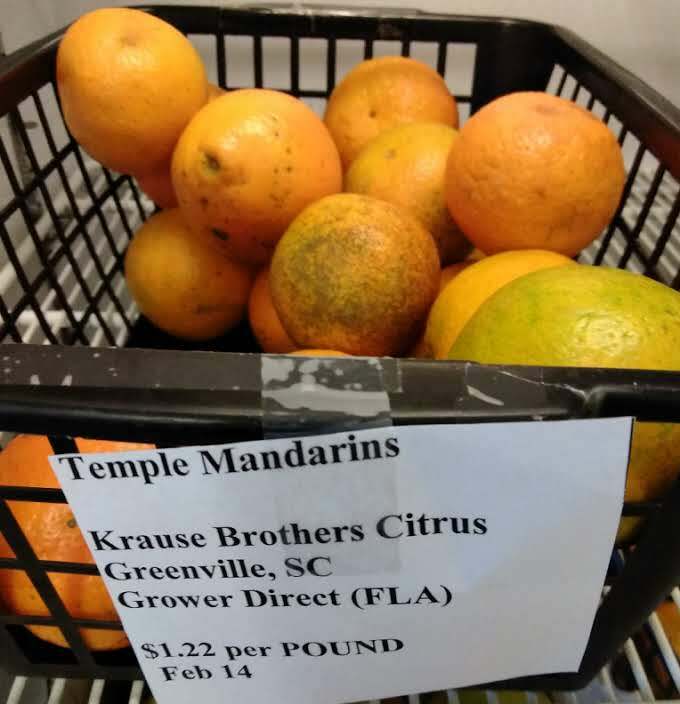 We received an order on Feb 14 from Krause Brothers which includes fresh squeezed orange and grapefruit juices along with lots of oranges and grapefruits. 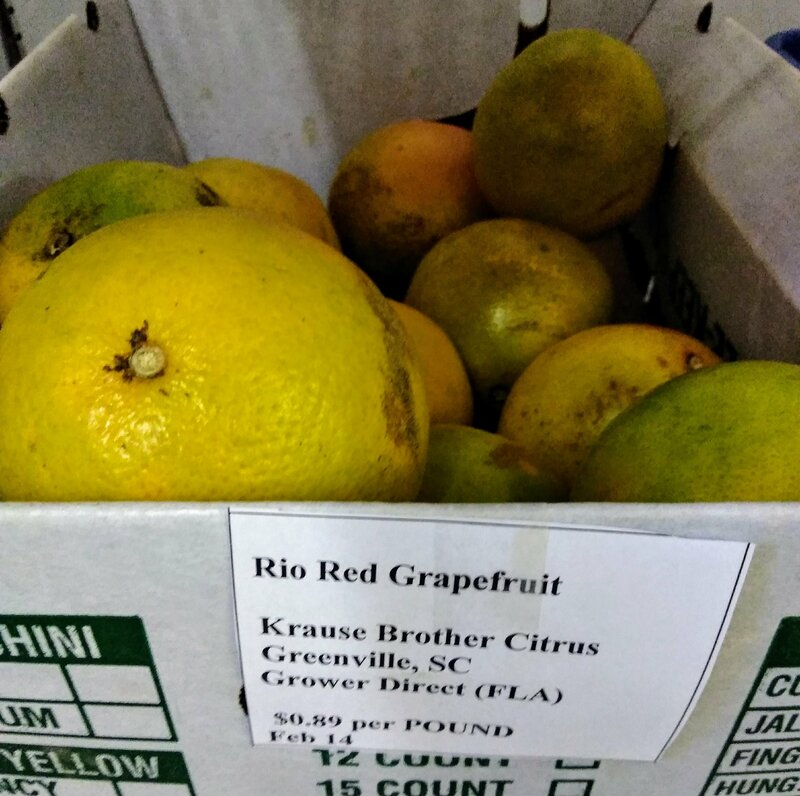 Local, fresh ginger available from Laurel Horton of Patchwork Garden in Seneca. It is a short season, so get it while you can. Jeni’s Splendid Ice Cream (two flavors Brambleberry Crisp and Whiskey & Pecans). ORDER DEADLINE IS MARCH 2nd. We can order from Pure Encapsulation, Douglas, Biotics Research, and Endo Met. All of these are supplements that you usually have to purchase through a health care provider. Discontinued Items: To view the complete list of discontinued items click HERE. Nutiva brand Organic Red Palm Oil 15oz is discontinued from the Co-op shelf; full cases of six jars are still available by special order only. The supplement shelves have been organized to group products by type (vitamins, herbs, etc.) rather than by brand or company. *Please share any feedback or suggestions for improvement with Gale Farrier or Katherine Vinson. To see a complete list of supplements available, click here. To see supplements listed by BRAND click here. Good supply of cheese, milk and chocolate milk is available for special order. When placing orders you must place your order before Monday. You can call in your order and leave a message. Messages are checked early Monday morning before the order goes in. Eggs are stored in the refrigerator by the supplements. We procure from 4 suppliers. If you would like to sell eggs through the Co-op please contact Lori Pierce for more information (Mondays at the Co-op or call her at 864-843-2584). Sami’s Bread has changed their disclaimer, which can be viewed in detail here. We will place the next order when the order minimum is met. Dimpflmeier Bread: We have a good supply in the freezer! A new delivery of Back Roads granola (gluten free) is available. What products do you like? Which items did you try and did not like? What type of items or brands would you like to see at the Co-op? Email Jackie Caldwell about Gluten-Free product info. Always looking for good suggestions for new gluten free products. We are trying to determine which pet foods to stock. If you have a preference for pet food you would like to purchase through the co-op, please call (864-506-4345) Frances Chamberlain with your requests. The Co-op offers a 5% discount to all seniors 65+ on the 3rd Saturday of each month. The next senior discount day will be held on March 17th. To receive the discount please inform the cashier BEFORE you begin your transaction; the discount will not be available after you have already checked out. Your markup will be reduced by 5% for that day; however, no markup can go below 0%. Roast bell peppers: you can roast them on the grill or in the oven. I roasted mine in my oven under the broiler. I pre-heated the oven to 375 degrees, and then broiled the peppers on high for a few minutes until the skin was blistery/starting to blacken, and then I turned them over and broiled them on high for another few minutes until the other side was done. Cut off the top of the pepper (save for garnish) and scoop out the insides, and the seeds and discard. 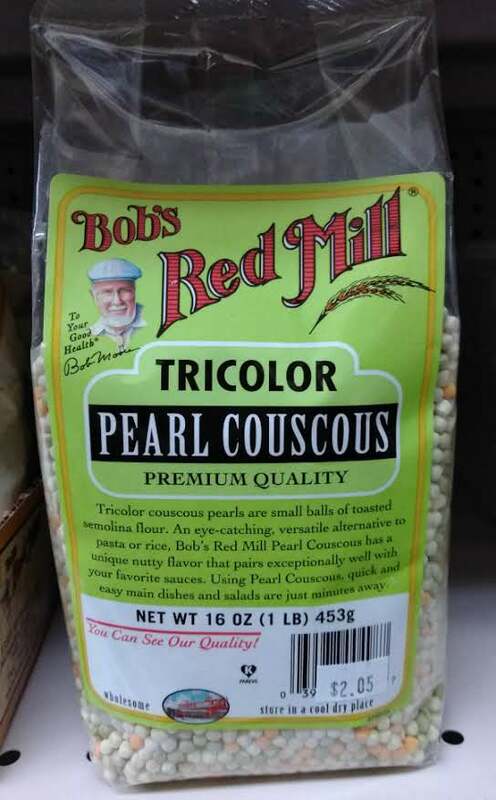 Combine all other ingredients in a large mixing bowl. Spoon into bell peppers. Bake in oven for 30 minutes. Remove from the oven and let rest 3 minutes. Enjoy with avocado lime sauce. Chop Avocado, juice limes: combine all ingredients in blender or food processor and puree until smooth. We have need for people to help with the following: Contact Theresa Pizzuto. Newsletter writers to write short articles for quarterly newsletter. Discussion of health issues at the Clemson Library the 2nd Tuesday each month at 7pm. All are welcome to attend (next meeting Tuesday, 3/13/18). For further information contact Gary at 864-868-0107 or Lori at 864-843-2584. 2018 Board of Directors Meetings Dates (5:30pm) at the Central-Clemson Library: TBD please stay tuned for details. To see the full meeting calendar click here.Enjoy your week!